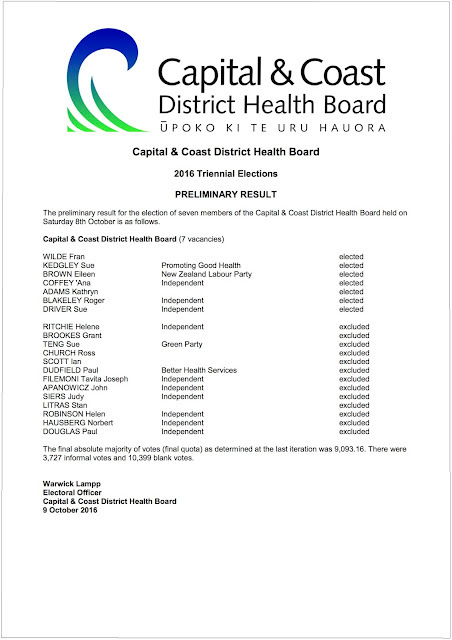 The preliminary election result for Capital & Coast DHB has now been released. Of the 211,000 voters in the Capital & Coast District, just 79,866 (38%) took part on the DHB election. The number of people who gave me their number 1 vote was up by a third on 2013, placing me in the top seven after first preferences were counted. But the transfer of second, third and subsequent preferences under the STV voting system did not go my way. I dropped out of contention when the people who voted for Fran Wilde (a candidate now close to the National Party) had their second choices counted. I am disappointed not to have been elected, not only for myself but for all of those who worked hard over the last few months on my campaign. But beyond this, what does the result mean for the Board, and for the health of the Capital & Coast District? Personalities and “names” always loom large in local elections. But as the campaign wore on, it became clear that there was also a contest over some defining issues. In my case, I stood for a model of healthcare which was informed by my nursing knowledge. I promoted a stronger emphasis on primary healthcare and a population health approach, rather than a focus on hospitals, in order to address the needs arising from this century’s growing epidemics – including obesity, poor mental health, and long-term conditions related to ageing. This meant tackling health inequalities, and the social and environmental determinants behind them. And I stood for a return to a fully-funded health system, where the DHB doesn’t have to fundraise for life-saving medical equipment like MRI scanners. I was clear that this could lead to some disagreements with the Health Minister over appropriate funding levels. It is satisfying to see that some candidates were elected who broadly shared similar views on these questions – Sue Kedgley, Eileen Brown and Roger Blakeley. But the voters of the Capital & Coast District also chose candidates with opposite views. Among elected candidates was one who said that an expanded range of specialist hospital based services, rather than primary health care or health promotion, must be the highest priority. She argued that population health issues such as obesity required an emphasis on “individual responsibility” and did not agree (for example) that climate change was a significant environmental determinant of health requiring DHB action. Other successful candidates argued that limited resources meant “better ways of working” were needed, rather than more funding. And some were elected who either explicitly stated that their primary responsibility would be to the Minister of Health, not the community they represent, or who had a long record of service as ministerial appointees. So the election result will mean no major change in direction. Given government funding signals, the recent pattern of creeping cuts at CCDHB is likely to continue and health inequalities and unmet health needs will persist. My commitment to the health of the district remains. So I will now turn my attention to supporting the progressive candidates who have been elected, to the best of my ability from outside the boardroom. Once the unelected Ministerial appointees and Crown Monitor join them at the Board table, sadly they’ll be a clear minority. 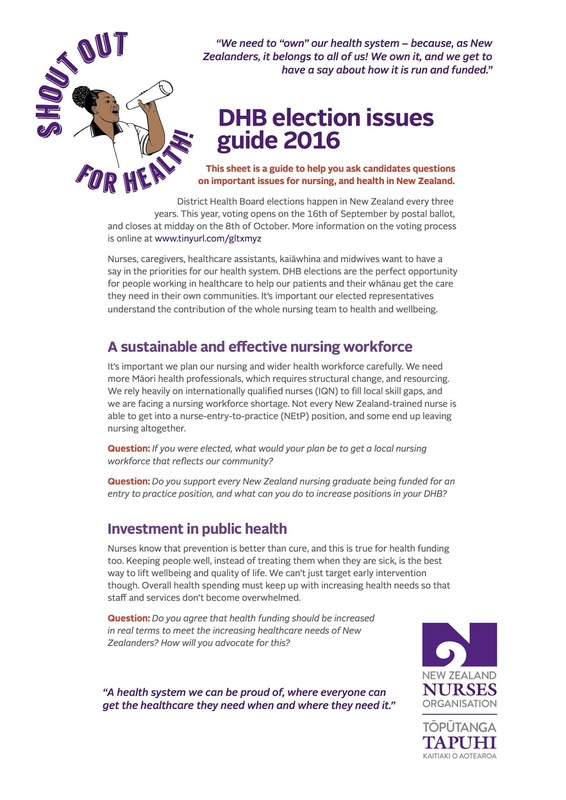 As part of the 2016 DHB elections, the New Zealand Nurses Organisation asked a series of questions on health priorities of all candidates with a valid email address accessible through a Returning Officer. I played no role myself in the formulation or dissemination of these questions. Here are my answers. Question: If you were elected, what would your plan be to get a local nursing workforce that reflects our community? Developing the local nursing workforce is a project with a very long lead-time. Today’s newly Registered Nurses began studying at least three years ago. The tertiary institution they graduated from was planning its student numbers at least a year prior, based on budgets set in financial years before that. And the same thing was happening, in an uncoordinated way, at 23 campuses from Kaitaia to Invercargill. The sad reality is, we are now reaping the consequences of years of poor workforce planning at the national level. The nursing workforce has just half the number of Māori and Pacific nurses needed to reflect the population. And this problem won’t be fixed by one DHB, in one three-year term. The Māori population in the Capital & Coast district is slightly below the national average, but we still have far too few Māori nurses needed to reflect our community, and too few Pacific nurses as well. The Board of Capital & Coast DHB has only a limited ability to rectify such long-term planning failures. But we are extremely fortunate to have, on our doorstep, the BN (Māori) and BN (Pacific) programmes at Whitireia, helping to meet pressing workforce needs. And I believe it was simply unacceptable that so many of last year’s graduates from these programmes were not offered employment at our DHB. Question: Do you support every New Zealand nursing graduate being funded for an entry to practice position, and what can you do to increase positions in your DHB? I have nailed my colours to the mast on this, more than once or twice. And I am greatly looking forward to being in a position where I can act directly to increase the number of entry to practice positions for new grad nurses. Employment of new graduate nurses is a operational matter decided by managers and based on many factors, including skillmix requirements in individual wards and departments, availability of preceptors, vacancy rates outside the DHB in primary health and aged care, and so on. But what I can do as a Board member at Capital & Coast DHB is work to ensure that budget constraints are not a reason to deny a new grad a NETP place. Question: Do you agree that health funding should be increased in real terms to meet the increasing healthcare needs of New Zealanders? How will you advocate for this? Reversing the decline in our health funding is one of my top five campaign priorities. How will it be achieved? A case will need to be built for why the government’s Population Based Funding Formula does not deliver appropriate results for a tertiary DHB like ours, based in a district with above-average income and only a small rural population. As part of a like-minded team, I will support patient explanation that providing regional and national services cannot continue to be done with the lowest per-person funding of any DHB in the country. There may also be potential to work with other DHBs on seeking a review of the capital charge levied on DHBs by government, which was recently highlighted by the Office of the Controller and Auditor-General as counter-productive. But we need to be clear. The Minister of Health has said that funding has already been increasing in real terms to meet the increasing healthcare needs of New Zealanders. So achieving this campaign priority will also require the application of sufficient pressure to make the Minister of Health shift his public position. Sustained advocacy will need to be undertaken by a broad coalition, including local politicians, community groups, unions and professional bodies, local media outlets and so on. But as I have highlighted at candidate meetings, there is a successful precedent for this strategy – the $20 million cash injection received by Canterbury DHB in March. And I am pleased that I was able to play my own small part in applying the pressure to deliver that result. Question: Is your DHB using CCDM effectively and how will you support this? Capital & Coast DHB sent an Expression of Interest in implementing CCDM to the Safe Staffing Healthy Workplaces Unit in 2015 – a full six years after the programme began. The next step in the formal implementation process still hasn’t been taken. So while there has been preparatory work, our DHB is not yet using CCDM at all and progress towards this goal is extremely slow. I will support CCDM by backing the efforts of the Director of Nursing & Midwifery and by squarely addressing barriers to faster implementation – above all, chronic underfunding (see above). Question: If elected you will have some influence of over DHB contracted services. Do you support a minimum legal safe staffing requirement for aged care? I have campaigned for years for a minimum safe staffing requirement for aged care. 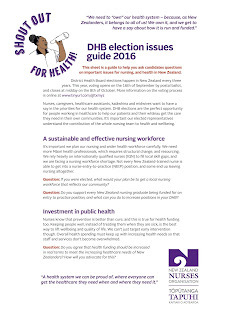 When I stood for election to Capital & Coast DHB in 2013, it was one of my priorities then. The following year, I attended the Caring Counts Summit, aiming to pressure political parties to support mandatory minimum staffing levels in the lead-up to the 2014 general election. And this essential part of putting the “care” back into aged care remains an election priority for me today. 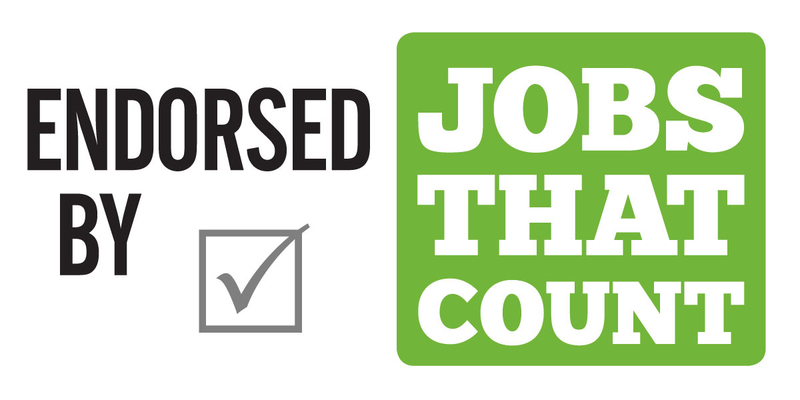 Question: Do you support your DHB becoming a Living Wage employer and would you use your vote on the Board to make this happen? Having led the New Zealand Nurses Organisation to achieve accreditation as a Living Wage employer, I now want to do the same at Capital & Coast DHB. As one of many candidates supporting the Living Wage, in a region where momentum is building, there is a real possibility that when I use my vote on the Board, we may have a majority. Question: Do you support equal pay, and what will you do to make it a reality? My activism in the pay equity cause has spanned decades, and continents. It reflects my deepest values. Equal pay for women was a motivation for one of my first political acts as a young nursing student – protesting the repeal of the Employment Equity Act and the widening pay gap at the National Party conference in Dunedin in 1995 – and a subject of my very first published article that same year. And it has remained a high priority in the years since – from helping fundraise for legal costs in the early days of the Kristine Bartlett case, to drafting the policy remit which was passed by the 2014 NZNO AGM, “that NZNO fully commits to supporting the legal, political and industrial campaign to achieve pay equity for women”. I highlighted the issue in my first media interview as NZNO President and made it one of my “three wishes” in the Christmas issue of Nursing Review. This year, I was able to put the issue of pay equity on the global agenda, at the International Council of Nurses meeting in Geneva. So I will continue to do everything in my power to make pay equity a reality. Question: Do you believe the nursing workforce is paid fairly, has safe working hours, and terms and conditions that value their contribution to your DHB? I know for certain that the nursing workforce isn’t valued highly enough. And as one of six nurses who spent the better part of a year negotiating the pay and conditions on behalf of our 27,000-strong nationwide workforce, I think I can say that privately, many DHB leaders feel the same way. The problem lies with inadequate health funding from central government (see answer above). Question: Do you support a health impact assessment for all major policy initiatives and social and infrastructure projects of your DHB? Will you work to make this happen? This is a policy tool which I have only recently started to become familiar with. But based on what I know, I am happy to say that I will support these health impact assessments. I look forward to learning more about what they involve. Question: What will you do to reduce your DHB’s contribution to global climate change? In May, I addressed the Grand Round at Wellington Hospital, presenting the NZNO Position Statement on Climate Change and Health. While I was there, I met with some members of the former CCDHB Green Initiatives Group – which sadly went into recess some years ago – to get a grasp of the enormous task of reducing the DHB’s greenhouse gas emissions across a huge range of operations. I learnt of plans to re-establish the group, after a business case for a DHB Sustainability Officer had recently been approved by the Board. My role, as a Board member, in reducing Capital & Coast DHB’s contribution to global climate change, will be to work with this group to set realistic targets for emissions reductions and to ensure sufficient resourcing to reach those goals. Question: How will you work with other central and local government agencies to make our community safe and healthy for everyone? An emphasis on cross-sector collaboration is one of the positive outcomes of last year’s review of the New Zealand Health Strategy. And with a number of candidates for Capital & Coast DHB also standing for other positions in the local elections, collaboration between the DHB and local government has been a theme of the campaign. I have tried to expand the horizon of what’s seen as possible by continuing to raise the example I presented to Greater Wellington Regional Council last year – the pioneering approach of Healthy Auckland Together. 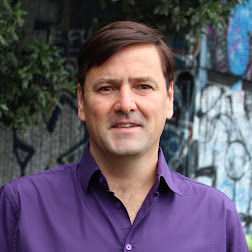 Interim steps will be needed towards such a large-scale collaboration (the Auckland coalition includes 21 organisations, representing local government, mana whenua, health agencies, NGOs, university and consumer interest groups). I have conveyed to Wellington Mayoral candidate Justin Lester my support for the joint Council-DHB “wet house” project, to address homelessness and substance use in our community.